When my then fiancé (now my husband) proposed to me, I gave him my left hand by default. When we were buying our wedding bands, I was not yet sure which ring finger to put mine on. Fortunately the ring that we decided to get goes really well with my engagement ring, so I thought of wearing them on top of each other. Like any other new bride, I was clueless about ring placements and traditions. There is really no hard and fast rule on how to wear engagement and wedding rings, but each country and culture have their own set of guidelines and traditions. 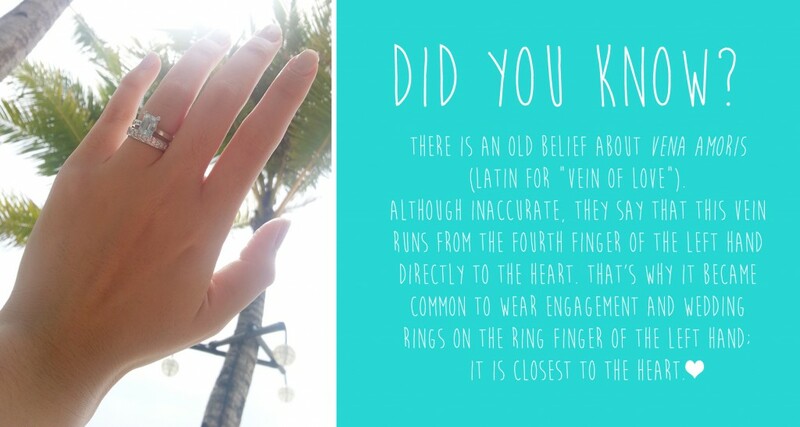 In Catholic and Protestant countries like Russia, Germany, Greece, Spain, Norway and Poland, brides often wear their engagement and wedding rings on the ring finger of the right hand. Those from England, France, Canada, US, Mexico, Ireland, Sweden and other Commonwealth countries generally wear theirs on the ring finger of the left hand. Muslim weddings don’t normally include the practice of exchanging rings but they have already adopted this Western tradition. Jewish couples wear the wedding ring on the left hand, even though it is placed on the right hand during the marriage ceremony. Jewish grooms place the rings on the index fingers of their brides, since that is the finger with which they point to the Torah as they read. Women in Scandinavia wear three rings, one each for engagement, marriage and motherhood. In China, brides wear their wedding bands on the right hand and the grooms on the left. This is based on the custom of ‘nan zhuo, nu you‘ (male left, female right). They believe that since the the woman is in charge of the household, she should wear her ring on the right hand because it has more force and influence. Although rings are usually exchanged in Japanese wedding ceremonies, many Japanese couples choose not to wear their wedding bands after the ceremony. 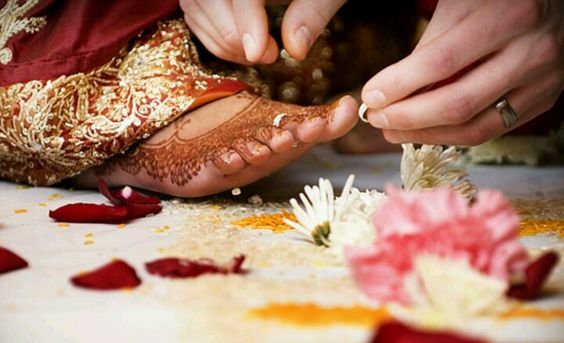 In some parts of India, Hindu women may wear a toe ring or ‘bichiya’ instead of a ring on their finger. Some women from Asia and the West wear the engagement ring on the left hand but move it on the right hand before the wedding ceremony to make room for the wedding ring; while some prefer to store away the engagement ring and wear the wedding ring solo. Some women from Eastern Europe wear their engagement rings on the right ring finger and the wedding band on the left ring finger. Some people believe that the ‘correct’ way to wear the engagement and wedding rings together is the wedding band first and then the engagement ring on top of it. 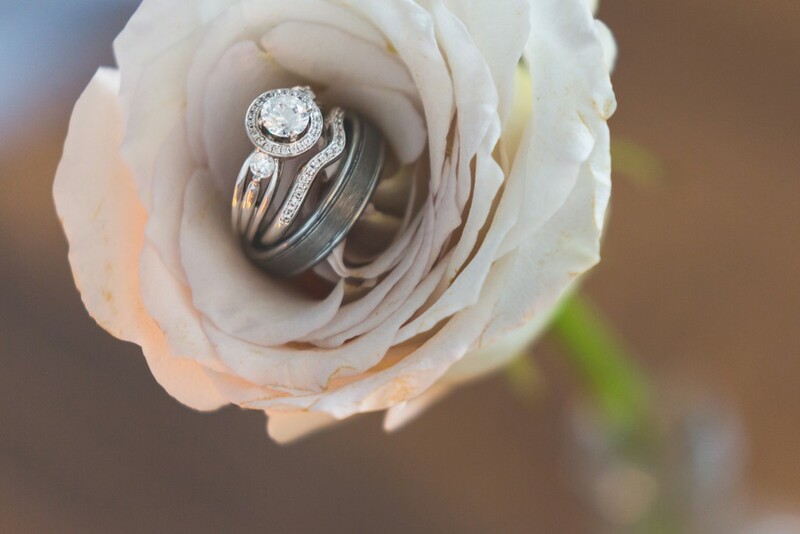 Some believe that wearing the engagement ring on top of the wedding band also ‘protects’ it and keeps it stable and grounded together with their marriage.